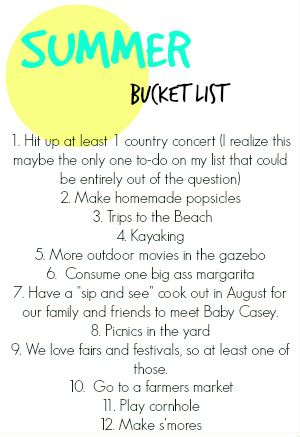 Compiling a summer bucket list seems like a practical thing to do when your 9 months pregnant right? Considering I have no idea how to balance a baby that's not here yet, life, work and my marriage? AND in lieu of mini golfing I wouldn't mind seeing Florida Georgia Line and Nelly. I'm feeling pretty confident that we can most likely accomplish half of this list! and obviously "Have this damn baby" is the unspoken to-do! 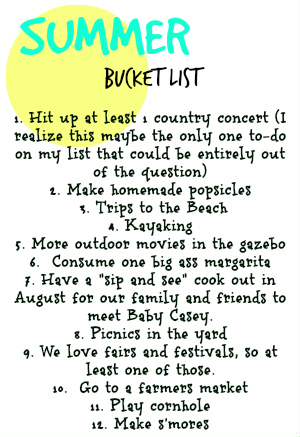 Hello fun bucket list :) I love it..
You'll find the time. You'll do them. It will take a hot second for you to get used to it, but then you'll realize that babies are super portable and that they stay in one place when you put them down at this age. Just get used to packing up the entire house. Haha. Love the list! We just bought a corn hole set so I'm super excited to spend out summer nights with a drink in hand and throwin bean bags in the other ;) Great bucket list!